In most American cities, a ride on the subway isn't a particularly luxurious experience. Funding is in short supply for most of the country's aging rapid transit systems, and most stations are utilitarian structures that were designed without much aesthetic consideration. The situation in Sweden couldn't be more different. Metro stations in Stockholm have been elevated to veritable art museums with stunning murals and playful art installations adorning the cave-like walls and ceilings. Click through to see some some of our favorite Stockholm Metro stations! The Stockholm subway system is often described as the world’s largest art museum — for the price of a Metro ticket, you can enjoy impressive works of art spanning from the 1950s to the 2000s. The Metro spans more than 110 kilometers, and 90 of the 100 stations in the system have been decorated with world-class murals and sculptures from 150 different artists. 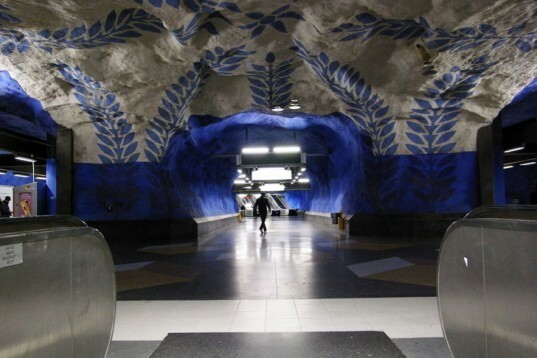 The T-Centralen station — the city’s central subway station — which was designed by Per Olof Ultvedt in 1975, is perhaps the most iconic of them all, and it features massive blue-and-white paintings on its cave-like ceilings. With its bright red walls and ceiling, the Solna Centrum station looks otherworldly. The Kungsträdgården subway station has been designed to look like an archaeological dig, and it features the remains of Stockholm’s old Makalös palace. And the Östermalmstorg stations features art by Siri Derkert that focuses on themes that include the environment and women’s rights. The T-Centralen station -- the city's central subway station -- is perhaps the most iconic of them all, and it features massive blue-and-white paintings on its cave-like ceilings. The T-Centralen station was designed by Per Olof Ultvedt in 1975. 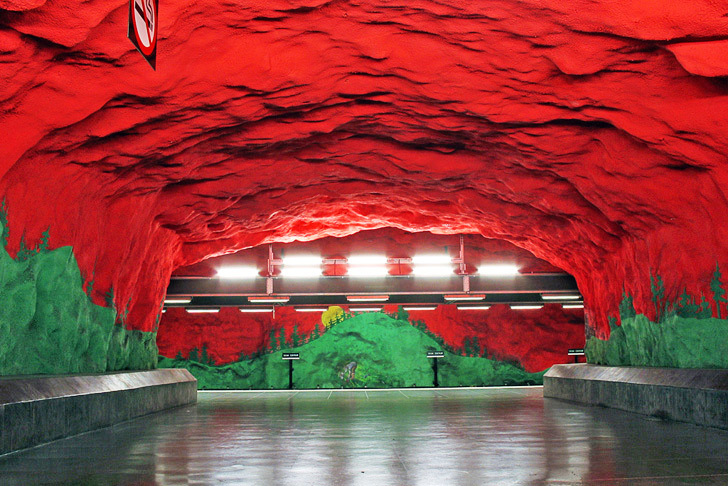 The Stockholm subway system is often described as the world's largest art museum. With its bright red walls and ceiling, the Solna Centrum station looks otherworldly. The kilometer-long Solna Centrum station is decorated like a spruce forest. For the price of a Metro ticket, you can enjoy impressive works of art spanning from the 1950s to the 2000s. 90 of the 100 stations in the system have been decorated with world-class murals and sculptures from 150 different artists. Beautiful stones are embedded in the walls of a Stockholm subway station. Even the train tunnel in the Solna Centrum station is painted bright red. The Metro spans more than 110 kilometers. The Stockholm Metro isn't just a great place to view art -- it's also one of the best ways to get around the city. Continuing the forest theme, a moose in a glass case is featured in the Solna Centrum station. To learn more about the art on display in the Stockholm Metro, you can take a guided tour.